No matter how much I love cooking, there is always a special thrill when I make something that I know has one of my kids or auntlings are going to get excited about. That’s why I love these cloud cookies so much :). They got their name from my nephew, Austin, about eight years ago. I’ve always been a fan of meringue cookies and I whipped up a batch when Austin was over at my house and decided to stir some chocolate chips into them before baking. Austin waited patiently while they cooked and then took one bite and declared them just like clouds – with the added bonus of chocolate chips! So if you want to be the cool aunt/mama/grandmama/daddy/uncle who knows how to bake chocolate chips into clouds…I got ya covered today! You’ll need: Chocolate Chips, two eggs, sugar, Cream of Tartar, a bit of salt, and some sprinkles if you’d like to add a little sparkle to your clouds...I mean cookies. Crack your eggs and separate the whites from the yolk. Add in a pinch of cream of tartar and your salt. There are all sorts of gadgets that do this but I just use my hands. 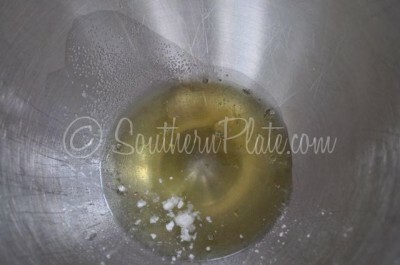 Usually, I crack the egg and just gently tilt it until the white pours off, saving the yolk in the shell. You can also pour the entire egg into your hand and spread your fingers slightly to allow just the white to slide through while the yolk remains. Or you can get one of those gadgeterators that lets you pour the egg into it and the white comes out of little spout on the bottom. Whichever way you go, make sure you don’t get any of the yolk (the dark orange part) in this because our meringue won’t fluff up if we have yolk in it. 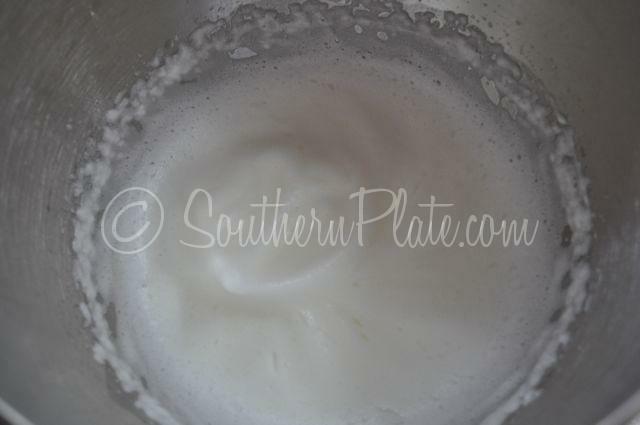 Beat your egg whites until soft peaks form. Okay so what this means is that you need to beat them on high with an electric mixer for a few minutes. 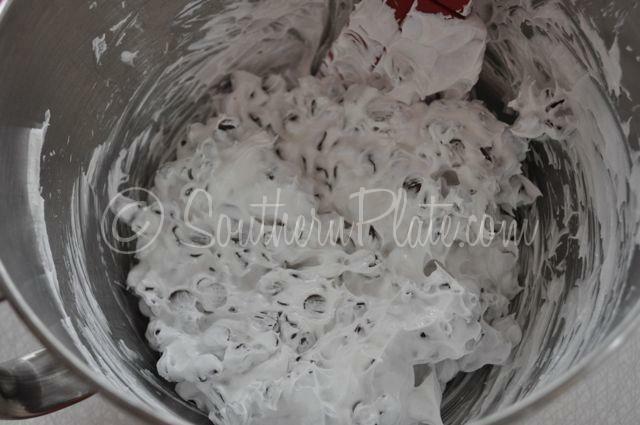 They will start out getting frothy and then begin to get foamy, and eventually turn white like this. As you keep on beating, they will start to hold their shape a bit, meaning you’ll see ripples remain in them where the beater has been. Stop your mixer and pull your beaters up. 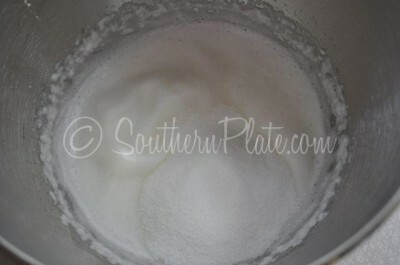 Where your beaters came out of the egg whites a point will come up. If that droops back down again (kinda like the top of a dairy queen ice cream cone), you have soft peaks. Add in your sugar and beat it some more, unit the sugar is well incorporated. It will get thick and glossy like divinity. 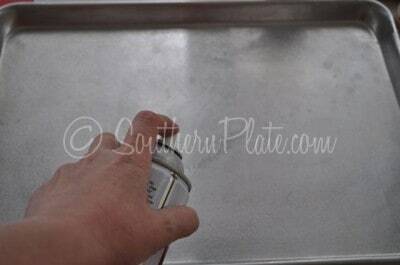 Place spoonfuls onto the greased baking sheet. A lot of my cooking is centered around my mood. Good thing I try to pick good moods out of the bucket each morning! Allow your clouds to cool completely and then store them in an airtight container, or just hand them to the kids in your life and watch them disappear! 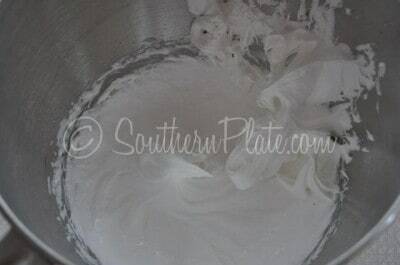 In a small mixing bowl, beat egg whites, cream of tartar, and salt until soft peaks form. Drop by level tablespoonful onto greased baking sheets. Sprinkle lightly with sugar, if desired. Cool on baking sheets for two minutes, then remove to wire racks to cool completely. *Be sure you grease your cookie sheets! 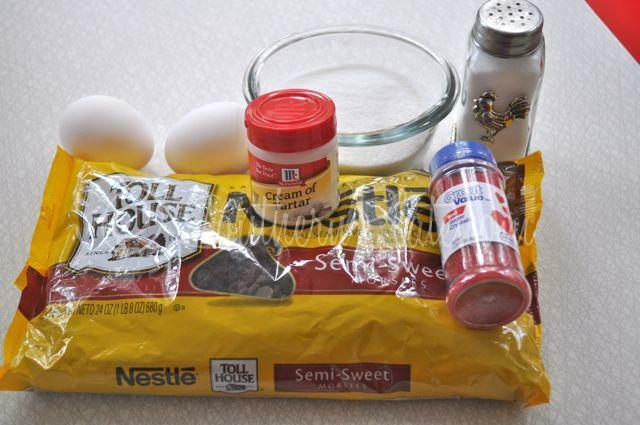 I’m teaming up with Nestle to help promote their Bake and Share Holiday Treat Contest! Click here to visit their Facebook page and get details on how you can enter your recipe for a chance to win $5000! We have some AMAZING cooks in the Southern Plate Family and I’d love to see one of you win this! Some people are so poor that all they have is money. Thank to to Ticha for submitting this one! Add your quote to our ever growing collection or go get inspired by some others by clicking here. And don’t worry about whether or not your quote has been submitted already. The good ones bear repeating! This sounds like a great recipe, and sooooo easy! I can’t wait to share it with the little ones in my life…..all 75 of them! I’m a teacher…smile. These are so pretty with the colored sugar. You mentioned your Mama’s divinity, would love to see her recipe. Divinity is such a hit or miss for me but we love it so I need some help. Your pecan pie recipe is my favorite, turns out perfect every time. Thanks for all the wonderful posts. My kids love these cookies! Sometimes I add food coloring to the egg white. Can you freeze these cookies? Thanks for posting this recipe. I haven’t ever tried it Ursula, they never last that long in my house. Let me know if you try it and how it turns out. Christy, your timing is perfect! I made my mom’s custard sauce for Thanksgiving, to put over her apple pie, so now I have lots of frozen egg whites just waiting to be turned into something. Definitely will make these. Yay!!! Perfect way to put them to use!! Thanks for posting this. I had a recipe similar to this years ago and lost it. Since then I just haven’t made any or looked for a new one. Now I will! I hope you enjoy Savannah!!! I had a receipe like this years ago also, and lost it over the years. The only difference is mine were called night nights because you turned on the oven to 200 degrees, then mixed up the cookies , got them ready to put in oven. Then you turned off the oven, put in the cookies said night night and leave them in the oven overnight.. They were so good!! Made them alot!!! That was about 38 years ago, uh oh telling my age… LOL So glad to find receipe again , even if it is alittle different. Thanks for this – this is gluten free (though some celiacs need to use gluten-free chocolate chips) so I can make these for my gluten-intolerant hubby. Very true Becky, I didn’t even think about that and I am always getting requests for gluten-free recipes! Thanks you so much for pointing that out!!! Christy, do you have a recipe for No Sugar Added or Sugar Free Cloud Cookies for us with diabetics in our families? I would dearly love to have that. Thank you. Christy these look so pretty with that added colored sugar! Can I use parchment paper instead of greasing my cookie sheet? Thank you for these wonderful little “clouds”. I bake for the senior center bake sales and I can already see red ones for Valentines Day and pink and yellow for Easter! I would think you could Mary. Just made 2 batches of meringue cookies on parchment. Works great and I’ve found you can reuse the parchment for a number of batches! I’ve tried these with Ideal sugar substitute, but it just doesn’t work in a meringue. The recipe will make 3 dozen cookies, though, so each biteful has little sugar. Also, my old recipe only calls for 1/2 cup sugar, so each cookie has less sugar. Just make them small and sound the warning to diabetics so they can adjust their intake. My mom and I made these so often when I was little – I haven’t had them in years! For an extra soupcon of awesome, add a tablespoon or two of cocoa powder to the meringue along with the sugar (no more, or the fat in the cocoa will interfere with the poofiness of the egg whites). Perfect baking project for this dreary day! We call the cookie “FORGOTTEN COOKIES” because we make them up, put them on aluminum foil covered cookie sheets to facilitate removing when the times arrives. They are put in a 350 degree preheated oven which you immediately turn off and allow the cookies to stay in the oven until the next morning…forgotten over night. Like Divinity, I only make them when no sign of rain is in the forecast. Along with the semi-sweet chocolate chips, I also add 1 cup of chopped & roasted pecans. Yes, Christy, I agree that they are just like clouds and melt in your mouth. P.S. : I also have a great Eudora Welty Divinity recipe (scratch) that I make every year for Christmas giving. Would be glad to send to you in an email if you would like to have it. I would love to have it BJ. Thank you so much for offering to share!! Christy, I have tried twice to send you the Divinity Recipe in this space. I have not been able to get my email with the recipe to come to you in this format. Maybe it is to long. If you will please let me know how to send it to you, I will be more than happy to do so. I posted the Eudora Welty Divinity recipe on Southern Plate’s Facebook page. Thank you so much for sharing BJ! Those just put me in the Christmas mood to bake. I also like Ursula’s idea of tinting them. My granddaughter loves the color and fancy sprinkles-the more the better for her. Your granddaughter sounds like my Katy!! I love this kind of cookie!!!!! Even a diabetic can have one or two of these. I am so glad you like them Beulah!! I am so glad to hear you liked them Melanie!!!! Can these be made with raw sugar? I haven’t ever tried it Ammy, if you try it let me know how it works out. Sometimes I add pecans only to the meringue mixture and they are also delish! Christy, waiting to hear if you’ve tried Splenda to make these! Looking forward to your divinity to compare with Mama’s. She only made it at Christmas (usually a Christmas Eve afternoon tradition) and it was soo good. I promised family I’d take up the mantle of divinity maker this year. We’ve missed Mama’s so much! Will definitely try these, they sound scrumptuous. It is just since I have been introduced to your site by a girlfriend that I have eventually attenpted to make cookies. Every recipe I tried so far I have succeeded. Thank you so much. 24 oz of choc chips??? 2 bags???? Really? That seems like an awful lot for such a small amount of meringue and number of cookies? Am I missing something????? Thanks for the heads up, mary, I would have tried them with Splenda! Not missing anything, you’re right on target (and a good reader!). These sound really yummy. Definitely going on my cookie making list for the holidays. Thank you for sharing. 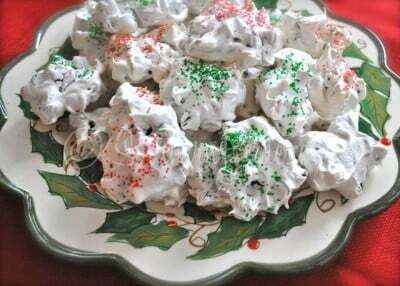 My mom has made these forever…we call them Nighty Nights because they would be the last batch of cookies she would make in the evening, we would put them in the oven turn it off and go to bed. I’m thinking of making these with white sanding sugar on top and white chocolate chips…thanks for the recipe. By the way, I forgot to include your corn pudding recipe in my Thanksgiving dinner and my daughter said it would have made the dinner perfect…there’s always next year. Have a safe and happy Christmas. Hum…I have to agree with Mama Owl. 24 oz of chips does seem like a lot of chips for 2 egg whites. I know the egg whites fluff up a LOT, but still…. seems like a lot. It’s not a misprint?? I thought it was a misprint too, but I made them today with the 2 bags, and to my surprise they turned out perfect. Thanks so much for a yummy goody. How cute! I cant wait to make these! Great idea! 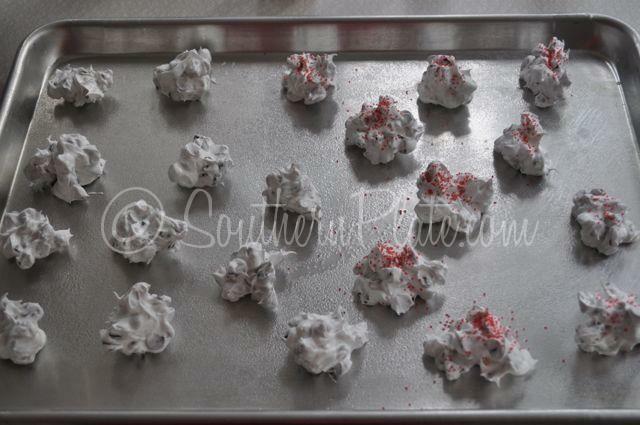 My mom & I used to make these years ago……called “White Divinity” and I remember adding chopped pecans to the egg whites after they were beaten….Yum to all the great ideas & thanks for sharing! I would love for you to post your Mom’s Divinity Recipe. Thanks for posting this, Christy!! I’m gonna try them. I am posting the Divity recipe from Eudora Welty on Southern Plate Facebook. Truly (Wells). My fingers made a type-o before. Oh these will definitely be made this year for the holidays! Thanks Christy. Since these contain chocolate chips, they will definitely be on my Christmas cookie plate. Sounds wonderful. Mom made Coconut Bon Bons and they were heavenly. I miss her more each year that passes. She was wonderful, and I find myself doing things like she did when I was a little girl. At 74, I have granddaugthers I hope to pass along your recipes. MERRY CHRISTMAS! God bless. Sounds really simple and tasty, My daughter has a cookie party every year for the past 4 years and they get bigger each year. This year the dress for the evening will be Christmas PJs. I can hardly wait. We are also making boxes for the son of one of the attendants who is in Afghanistan. So much fun. Look forward to the divinity recipe. Great recipe Christy! Would there be any problem using parchment paper instead of greasing the pans? Thanks for the recipe, I want to make this but was wondering if I could leave them in the oven overnight like BJ did with the Forgotten cookies? Oh, your corn casserole was a big hit Thanksgiving! Thanks!